The sewer is pre-billed at a flat rate of $145/user unit/quarter. The bills are sent out on the first of January, April, July, and ​October. ​It is important to stay current with paying your bill to avoid a lien being placed on your property. 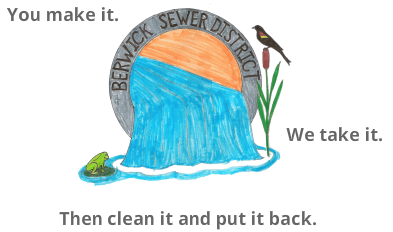 NOTE: Berwick Sewer District and the Berwick Water Department are separate entities. You will receive separate bills and pay at separate locations. Your bill will arrive as a postcard as shown. We accept cash or check/money order (payable to Berwick Sewer District). 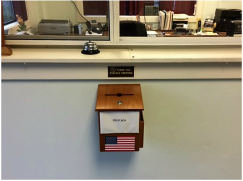 You can bring your stub/payment to our office, or you can mail the stub/payment to our post office box. The office is closed from 12 pm - 1 pm. There is a secure drop box in the lobby where you can place your payment during that hour. If you are a tenant and paying the bill, please be sure to include property owner's name and account number. If sending your payment in the mail, please include this portion of the bill with the payment. What happens if the bill is not paid? If the bill is not paid, the property goes to lien. You have 12 months to pay the lien, if it is not paid in that time, the property goes into foreclosure. Landlords: If the tenant is to pay the sewer bill and fails to do so, the property goes to lien in the property owner's name if not paid in time. ﻿How many User Units do you have?